LEN - www.lankaenews.com | How did a Multi billion dollar project find its way into the dustbin ? Exposure by Upul Jayasuriya chairman of Investment Board who resigned ! (Lanka-e-News – 22.May.2018, 10.50AM) Believe it or not ! Reports of a huge multi billion US dollar project for the country’s benefit had been thrown into the dustbin by some two penny half penny junior lawyers of the Attorney General’s department after being signed by them . Lawyer Upul Jayasuriya P.C. who resigned from the Investment Board which is the nerve center inviting foreign investment has via the letter (that is appended ) following his most valuable appraisal of the situation exposing the sorrowful state of affairs in the country which led to a US dollar 2000 million capital fund that was received going down the drain , has questioned what measures are going to be taken to remedy this colossal blunder ? The text of his letter is hereunder. …. Whither FDI in to Sri Lanka? GCEC law No 4 of 1978 was enacted on the 7th March 1978 by Prime Minister JR Jayawardena as he was then after assuming duties after the election that was held on the 22nd of July 1977. He did not waste time. He visualized it got the same drafted and implemented country's first ever free trade zone. He promised a righteous society and an open economy. He didn’t spell out much of the details of the open economy that he was planning for Sri Lanka. By far he had the best cabinet of Ministers ever established since independence. 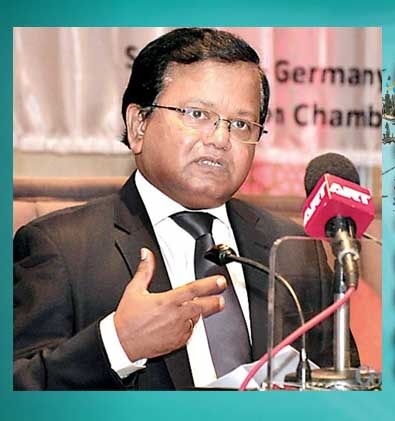 He didn’t waste any time in giving birth to the Greater Colombo Economic Commission which was the brain child of JRJ. He was ably assisted by Upali Wijewardena who has had much experience and exposure with the business conglomerate he has already established mainly in Singapore, Thailand and Malaysia apart from Sri Lanka in the conceptualization of the GCEC (present BOI). He had everything at his fingertips. That was the beginning of the BOI which was the 2nd such facility after Singapore in the entirety of the Asian region and the trend setter for countries like India, China, Malaysia, Vietnam, Cambodia who were all trailing behind Sri Lanka. JR Jayawardena's obvious choice was Upali Wijewardena to be the first Chairman of the newly established Greater Colombo Economic Commission. He didn’t budge from his decision though the Parliamentary Select Committee screening high posts, chaired by Premadasa didn’t approve his appointment on a petition submitted by MP Sarath Muththetuwegama. There were two able deputy director generals one in charge of administration, Paul Perera and Dr. Sivali Ratwatte. Non of them had worked in similar setup before. They were good listeners and amiable commanders who managed to create the country’s first ever free trades zones in keeping with the requirements of the investors. JRJ made it known publicly, "let the robber barons come! We are open !" There wasn't much of project evaluation as the choice was left for the investors within the legal framework. Many neighboring countries were envious of the potential of Sri Lanka. However they didn't rest. They copied Sri Lanka and were galloping behind. What did Sri Lanka offer? The GCEC Law was incorporated with an area of authority ranging from CHILLAW to Wattala extending towards Gampaha. First BOI Zone was established in Katunayake. The opposition and ‘patriots’ were not in favour of it. They didn’t go on rampage as they did in Hambantota in the recent past. Within the zone there was no local government laws that were applicable. There was provisions in the BOI law that labour laws weren’t to be applicable. However such provision were never enforced. That’s not all. By virtue of the GCEC (BOI) Law the Exchange Control Law, the Customs Law, and the inland Revenue Law were all to be regulated by the BOI. This was truly a one stop shop. Department of immigration and migration were given strict instructions to follow the advise of the BOI. These laws were contained in the schedule B of the GCEC (BOI) Law. Therefore The powers of the Customs Department, the inward and outward remittance of exchange by the department of exchange control were facilitated by the BOI. Tax holiday once granted, was regulated by the BOI. Granting of visa for the foriegn investors was upon the recommendation of the BOI. These powers as per the BOI law were extensive. However after 40 years of existence it is necessary to have a fresh look and evaluate the working of the same and improve the statutory provisions in keeping with the current global trends. It is particularly important due to corruption getting deep rooted. The writer has had the privilege of being associated with the draft of the law and the implementation of the same in its formative year. Expansion of the BOI free trade zones were hampered due to the on going war as village youth were reluctant to come to Colombo. Accommodation cost became high. Though there were 7-8 zones that were created by the then President Premadasa, he identified the problem of the dearth of labour force and their accommodation. He changed the structure of the BOI and changed the BOI law enabling the BOI to enter in to section 17 Agreements and to be located anywhere in the country with the full blessings of the BOI. Thus was the birth of the 200 garment factory program enabling the employment of the rural youth. Coupled with his world acclaimed housing program he changed the demographics of development by taking it to the village. Within days of an application all the relevant departments called the investor and volunteered to assist the setting up of the enterprise. No official failed as they new that the repercussions would be serious. After 1994 onwards whilst Sri Lanka was on the decline of the scales of economics; India, China, Malaysia, Vietnam and Thailand have begun their journey for the development of the economic zones with necessary changes in their legal structure making it conducive for the inflow of Investments. Many countries made Sri Lanka the example, Whilst Sri Lanka was held back with the communal strife our regional peers were galloping. After the end of the Premadasa era it was heart warming that the successive governments shredding the criticism they articulated whilst in the opposition, embraced the open economy policies. President Kumaratunga, President Rajapaksha and their respective regimes accepted the same policies of open economy with with open arms adopting different approaches. It was during the Stuartship of Dhammika Perera BOI approval was granted within a day. This attitude was very much encouraging to the investor. His point of view was that the project viability was a matter for the investor. BOI became truly a facilitating agency instead of a regulating agency. Whether the investment was black or white was a matter for the other agencies such as the Banks or its regulating agency the Central Bank through the financial investigation unit. During 2010-2015 approval process of the BOI was difficult. There were many obstacle that were placed locally and globally for reasons best known to the respective regimes. Locally the political masters took upon themselves the responsibility of the approval process. It was a lucrative process. The powers of the BOI were usurped by the Treasury and the granting of BOI facilities, tax holidays, availability of land , sale of land were all decisions for the political leadership. New law of strategic development was promulgated. Approval process was sought to be vested by law in the hands of the cabinet of Ministers. By virtue of section 3 and 4 of the strategic development law the facilities as defined by the cabinet of Ministers were regulated and tabled before the Parliament. There was no cogent reason as to why the same decision granting facilities to the enterprise had to be tabled before the cabinet on two occasions except it sent shock waves to the investing communities for the unequal treatment and the subjective standards that were applied by the BOI and other line agencies at the behest of the political leadership vesting upon them a lucrative discretion. Criteria that was adopted in giving strategic development status was subjective. Existing industries, apartment complexes and in some instances hotels were brought under this category. Shangrila Hotels, sale of the steel corporation, Check port city, Cinnamon Water Front are a few examples creating unequal among the equals. There were other obstacles that were placed on the FDI in follow with the European Union ban that was imposed on the export of fish and the GSP+ being taken away Garment industry was crippled. Foriegn ownership of land was further curtailed. Rule of law was in shambles. Democracy was in jeopardy. Judiciary was in tatters. Process of Investment approval was unequal to say the least. Decisions lacked transparency. Interest rates soared. In no uncertain manner investment climate was unwieldy. Capital funds were not available. Large number of local investors moved out of the country exploring greener pastures. With the dawn of 2015 the investor interest was rekindled. Many changes that were desired were in fact brought in. Independence of the Judiciary was established by the promulgation of the 18th amendment with the re-establishment of the constitutional council. Era of Enforced disappearances ended. butchering of media personnel diminished. New found freedom was enjoyed by many even to the extent of overstepping the mark. There was no executive interference on the appointment process of the judges of the superior courts. Rule of Law has been re-established to a great extent. Professional independence has been reinvented. Media freedom is in abundance. Right to information has been legislated. President’s election has been curtailed to two terms. Ministers and a high officials have been taken to task. However it is still the beginning of a long journey. With some of it the bureaucracy has been placed in an uneasy environment with the high flung politicians of all parties getting exposed and thrown behind bars. Executive powers of the Presidency were not enforced. Climate of less governance was brought in. In some quarters questions were posed as to whether we have done too much too soon and in some instances too little in maintaining discipline. Criticism of the government is directed from within. Ministers of the current cabinet are openly critical of their own colleagues. Many Ministers are galloping with Presidential hopes. Whether such criticism is expected or by design is not known. First Executive President JRJ who was responsible for the open economy and the strategic development of the country with the gigantic Mahaweli Development didn’t tolerate such criticism when it came from his own dear friend MDH Jayawardena. President Jayawardena wrote an emotional letter to MDH reminiscing his old ties, asked for his resignation as MDH Jayawardena had violated the collective responsibility of the cabinet. He compiled and tendered his resignation. However MDH didn't crossover. A new draft law was brought in proposing to take the powers away from the BOI. Powers of the BOI to enter in to Section 16 and section 17 agreements were to be taken away. Though the draft bill is yet to be enacted there has been considerable confusion on the investments policy and incentives and its facilitation if the wheel had to be re-invented leaving the BOI aside. Though the tax holiday that was extended to section 17 BOI projects ended on 31 ST March 2015 the BOI decided on its own to apply the 2006 regulation that was gathering dust issued by the Minister in charge of BOI under section 24 of the BOI Law. This too ended by 27th of April 2016. There were no more tax holidays to be extended. There were no more agreement to be signed by the BOI under section 17 of the BOI Law extending tax holiday. Number of applications that were received by the BOI dwindled. With the re-establishment of the independent decision making process of the administrative structure in the country, BOI has become one of the casualties. Coherence in the decision making process of high officials of different departments and statutory bodies has diminished. Policy planning and the implementation have been abdicated by the Ministry vested with such power. Each Ministry has begun policy making and implementation of policy. One stop shop that was expected to be designed and implemented by the BOI is diverted to multiple one stop shops under different Ministries. If Different Ministries promote investments there would be total confusion. Investors would be at a loss for direction. Be it availability of land, electricity, environmental issues, issues concerning forestry, local government issues, customs issues are multi faceted. It is imperative that this decision making process has to be centralized and handled with an iron fist. Such powers should be brought within the BOI Law with deemed approval. Whilst appreciating the enthusiasm and the positive approach of the single window Committee and the Cabinet Committee on Economic Management, yet it has to be noted sadly that even such decisions are not fully implemented by the respective departments and the officials. Hierarchical red tape has peaked. That was the end of the road for US 2 Billion Sri Lankan led American investment of an oil refinery. The manner in which some of the decisions are taken by the officials is much to be desired. Sometimes it is arrogance, sometimes it is ignorance, sometimes it is the integrity. A glimpse of the manner in which some official decisions were taken by an institution that was once considered to be the pinnacle of the public service is now in the public domain. Are we to allow the foreign investors to go through the same chores! Availability and the procurement of land for investment is a nightmare. Though decisions have been taken at the level of the President and the Prime Minister the snail speed at which the officials are moving cannot be tolerated and is unimaginable. The manner in which investors are shown the door by several line agencies are appalling. The BOI cannot face the music on its own. Identification of suitable land for proposed zones has been achieved by the BOI. However the acquisition process takes too long. Battle doesn't end there. Provision of infrastructure facilities such as land clearance, roads, water, electricity need support from many a government agency. Availability of funds is another issue. All steps have to be taken concurrently. Country cannot afford steps to be taken consecutively. It is desirable that development of these zones as identified in Horana, Matara, avissawella, Mulativu, Batticoloa and Kurunegala have to be fast tracked particularly with the participation of the private sector local or foreign as Public Private Partnerships. Proposed oil refinery in Hambantota, the electric railway manufacturing project and several other truly strategic projects have to be identified land. Bureaucratic inefficiency has opened the door for corruption. Is it only the line agencies? IE Surbana Singapore the state owned Investment Zone Development agency of Singapore expressed willingness to join up with BOI with a joint venture to plan the development of the corridor up to Trincomalee. I.E. Surbana Singapore has presence in more than 90 countries. They have agreed to make an exception to Sri Lanka and to enter in to a joint venture. This was the brain child of Prime Minister Ranil Wicremasinghe who initiated this with an MOU signed in the presence of the two Prime Ministers in Singapore. Several days of midnight oil was burnt in the preparation of the JV agreement by the legal eagles. Objective was to use the local professional talent in the planning of the new development within Sri Lanka and overseas. Precincts of the Beira Lake were on the map as a priority. This area consisting of nearly 220 acres government land only could have been declared as a BOI zone under the BOI Law. Even the acquisition or the divestiture of land could be facilitated under the BOI Law and fast tracked. A few weeks before the signing of the JV agreement the same was sent to the Attorney General's department for consideration as a matter of formality. Some petty state counsel looked at the draft and turned down the approval with a letter signed on behalf of the Attorney General. Even If there was any legal obstacle there was no counter proposal made by the Attorney General's department as a way out of the situation and the million dollar project ended in the dust bin. That was the unceremonious end of the road for a gigantic project. It is unfortunate that Hambantota investment zone has run in to troubled waters. This is the results of petty politics played by the 'patriotic' joint opposition. This is the first time ever in the world that political leaders were found leading mobs on the road and came in large numbers burning tires pelting stones on the large group of investors led by the Chinese Ambassdor and created mayhem. The so called bankrupt political leaders won the day and the country and its people lost. Entrepreneurs when deciding where to invest are mostly guided by the world bank index on ease of doing business. It includes to examine as to whether there are delays in starting a business, dealing with construction permits, getting electricity, registering property, getting credit, protecting minority interest of investors, paying taxes, trading across borders and enforcing contracts. During the last two years Sri Lanka has deteriorated in the ranking from 99th to 107th and then to 111th world wide. This can be for two reasons. It can be that other countries have improved their short comings and improved their procedures or it can be that ones own procedures have worsened. Either way Sri Lanka is not in a comfortable situation that one could be proud of. BOI's contribution in the Improvement of Country's ranking is minimal. It could only be catalytic. However when FDI flow dwindles BOI will be asked to explain. Large number of agencies have to share the resources with accelerated decision making process have to be adopted to enhance the investment climate and improve the country ratings. If this can't be achieved within a short period of time it will never be done. We have discussed enough. Three years have passed. Either we have stagnated or deteriorated. It is best that we start with the failures rather than successes. Contribution of Outside agencies to improve the the situation is minimal. Whilst appreciating the contribution of the World bank, IMF and other researchers such as Harvard Business School, such experiences would be based on hearsay observations. In protecting minority interest of investors and enforcing contracts Sri Lanka is way behind. In the enforcement of contract Sri Lanka is 169th out of 185 countries. Be it insolvency proceedings or in the protection of minority interest Sri Lanka's situation is much to be desired. There have been no rules promulgated either statutorily or by rule to fast trac cases of the BOI companies. It was only the BOI law that has a special provision where no enjoining order could be issued against a BOI company without one months notice. It is high time that there be some time limits to be introduced with summary procedure by way of amendment to the BOI Law. Service of summons to a Foriegn company is a nightmare. It has to be translated and summons are to be issued through the Ministry of Justice. This process would take minimum two years. New civil procedure code amendment has over looked these concerns. Issue and service of summons is no better. In a matter of regular procedure it takes more than 8 months for the issue of summons by the courts. In the case of enjoining orders the opposing party would refuse the acceptance of summons and do the damage in an irreparable manner making the enjoining order negatory. In a recent case in one of the High Courts of India notice and the enjoining order was issued by a whatsApp message adopting modern technology. Why is Sri Lanka lagging behind? In the matter of dispossession though the law requires that the matter be concluded within two months the rule is always in the breach. The Judicial Service Commission and judges of all rank have to be sensitive to these issues. It is imperative that Sri Lanka has to be more vigilant, sensitive and responsive to these issues. Current regime has few more years to go. It's not too late to address the issues. It is inevitable that many heads have to roll. Several amendments in the law would be essential. Change of many rules would be important. Whilst appreciating the efforts of the world bank and the Howard business school it is imperative that we have an analytical view of the failed projects. It is also important that we look at the projects that do not realize and 10-15 agreements that are terminated by the BOI periodically. It is equally important to facilitate the projects that have begun the investment process. No investor comes to Sri Lanka with gunny bags of money. International Banks would have to be attracted. Growth funds that are already tapping on the door of the BOI have to be accommodated. There has to be a new regulation that has to be promulgated under section 24 of the BOI Law by the Minister of strategic development enabling such equity funds. This has been attempted many a times and has been unfortunately turned down by the legal draughtsmen due to lack of knowledge and understanding. At least two of such growth funds that had lined by more than US $1000 Million have been turned away. This country cannot afford to pay such a heavy price jeopardizing our future generations. Time is running out for Sri Lanka. Policy makers, Law makers , monitors , officials and other support services have to wake up from its deep slumber and be vigilant. No more time can be wasted as we are on the brink of extinction from the global investment destinations having inherited a debt ridden economy with a brand new international airport with no planes and a brand new international harbor with no ships.